I finally got my hands on some of the new Sizzix "thinlits" dies. They are different from the framelits. I made this card today using the "fancy label and flowers" set. The dies come with a small sheet of ejection foam in case you need to use it to get your die pieces out of the die. I used only 2 of the 6 dies that are in the set to make this card. I wanted something easy for a thank you card. The stamp is Hero Arts. 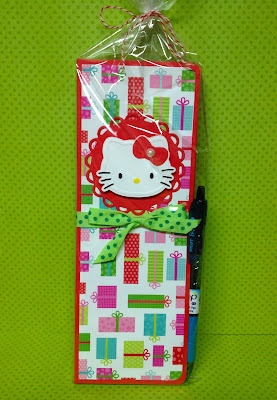 And the dies come packed in this cute plastic envelope. Great way to store your thinlit dies. So hard to believe that the year is almost over and soon it will be 2013. I've been trying to clean my craft room but it seems endless. Everytime I start to organize, either the UPS or FedEx man shows up with more boxes and then I'm back to finding a new home for my things. Well, thanks for stopping by today!!! And if I don't get a chance to do another post, Happy New Years!!! Hi and happy Friday!!! This is probably the first year that I haven't posted holiday cards. But today I made this clean and simple card using the "bubble joy" die from Memory Box. I stamped a holiday message on the inside of the card. I love how easy this was to make and I'll probably have to make several more. 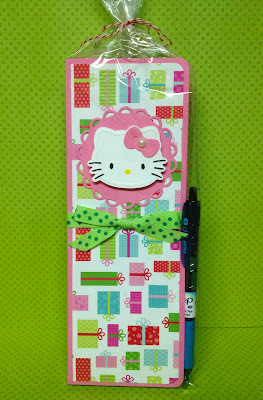 This next photo is a long notebook that I made and used a Hello Kitty die on the cover of the notebook. I made a bunch of these in different colors for the stamp club group ladies. I had a stack of precut notebooks lying around and finally found a use for it. Hope the ladies like it. Thanks for stopping by even though I haven't been posting as much as I would like to. It's been quite a year and looking forward to 2013!